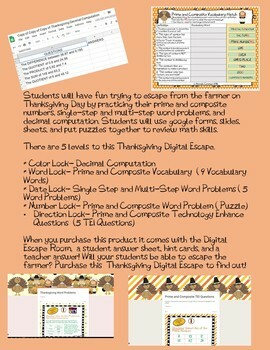 Students will have fun trying to escape from the farmer on Thanksgiving Day by practicing their prime and composite numbers, single-step and multi-step word problems, and decimal computation. Students will use google forms, slides, sheets, and put puzzles together to review math skills. 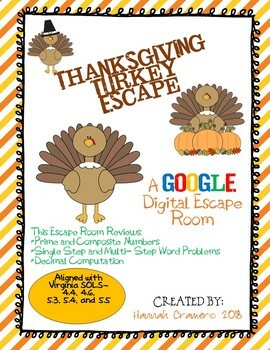 There are 5 levels to this Thanksgiving Digital Escape. When you purchase this product it comes with the Digital Escape Room, a student answer sheet, hint cards, and a teacher answer! Will your students be able to escape the farmer? 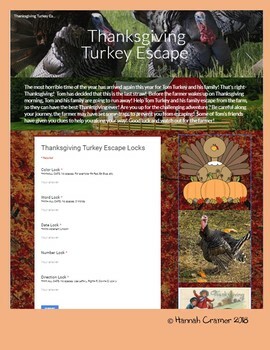 Purchase this Thanksgiving Digital Escape to find out!